Raising Funds Online and My Experience with it. I had been following this NGO closely for a while. 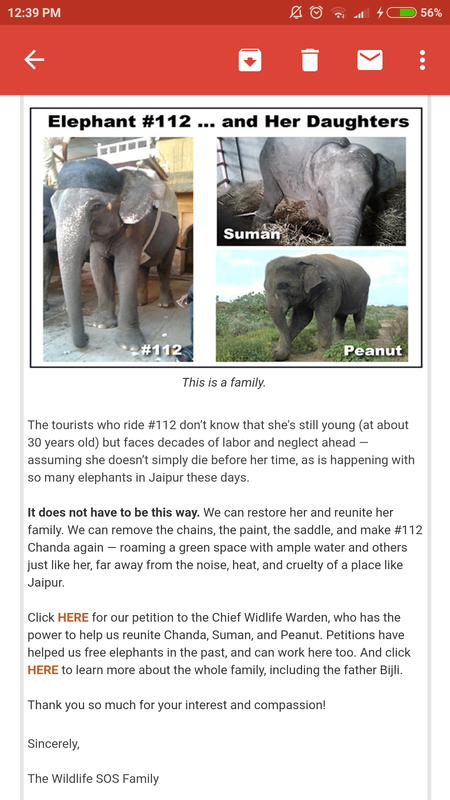 I read nearly every newsletter I receive from Wildlife SOS, and am always in awe of the work they do. Their emails contained detailed accounts of various rescue operations, which always sounded so adventurous and noble! Originally from Kerala, where elephant abuse is quite rampant, I’d always had a soft spot for the huge, beautiful animals. I grew up thinking chains on elephants were quite normal since no one spoke up against it. Moreover, I’d never seen the tamed elephants put up a fight. It was only later that I realized how brutally the animal is made to submit, and how much pain it is in for the rest of its life. An elephant’s natural habitat is in the wild with its family, not in a dark shed, or entertaining tourists for 16 hours a day. Shockingly, I found no renowned local organizations in the state working against this! Evanna Lynch, one of my favourite actresses growing up, posted a picture on Instagram, of a Keralite mahout beating an elephant. She spoke about investigating with UK-based NGO, Save The Asian Elephants that was working to change the way these animals are treated in not only Kerala, but other parts of Asia as well. She spoke about how the mahouts couldn’t be blamed because no one taught them any better, and that education is key. Elephant abuse isn’t just limited to Kerala though; enslaving elephants in circuses and tourist spots is a common practice across the country. Wildlife SOS was one of the most credible NGOs I knew, that worked to change the figures, not only with elephants but other wildlife species as well. They would often pop up on the news, about their successful rescue ops. At the time, I’d been working with Impact Guru for about ten months. Being a part of the Communications team, I was constantly writing blogs, social media posts and articles about how crowdfunding worked, steps campaigners needed to take to reach more donors, how to make the right appeal and so on. 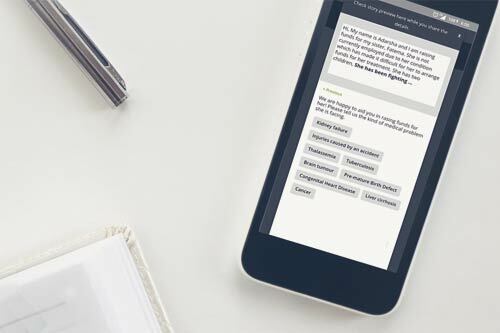 Though I had deep insight into the crowdfunding industry and was well-versed with Impact Guru’s platform, I had never actually run a fundraiser myself. I’d always meant to do it, even before I’d started working here. I had seen a few friends crowdfunding for a social cause and thought it was a great way for young people to not only raise awareness about important causes, but actually give back as well. What better time to test my skills than now, when inspiration had finally struck! As I’ve iterated several times across blogs and articles, fundraising isn’t an initiative taken alone. The most effective and successful fundraisers are those that have been run by a team of people actively spreading the word. 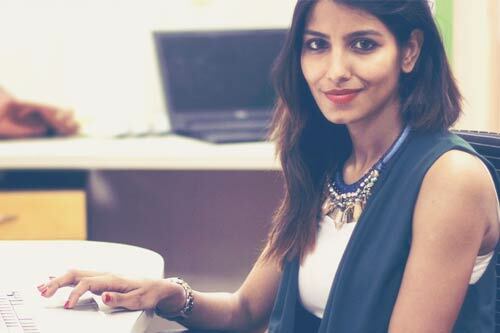 So I approached my colleague, Rukmini. She had been thinking about fundraising for an animal-related cause as well. We agreed that we’d raise funds for the Elephant Conservation and Care Center, run by Wildlife SOS in Mathura, Uttar Pradesh. We began with a goal of Rs 1 lakh. 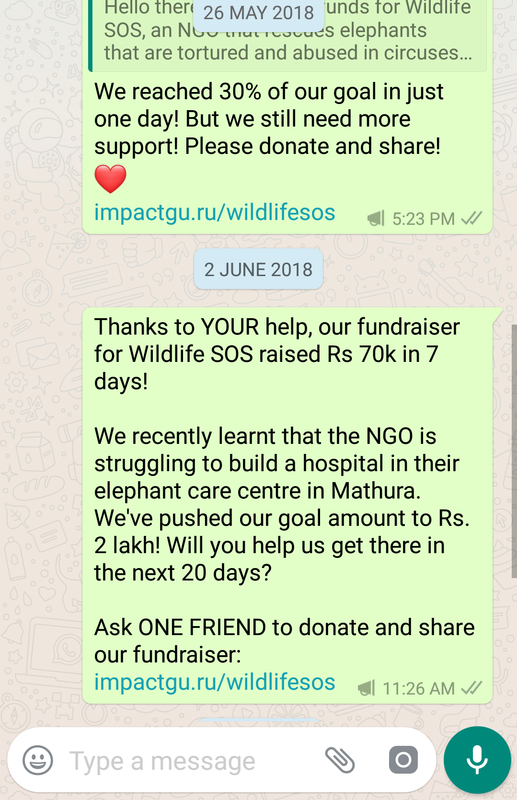 We wrote an appeal, starting with a description of how elephants are treated in India, the kind of work Wildlife SOS does to change this and how exactly the funds will be utilized at the care center. Whatsapp: I created a broadcast list of people I thought would likely donate (about 200 people). Over the period of 1 month, I sent 4 messages. The first, on the day I started the fundraiser, briefing receivers about the cause and its importance. The second message congratulated receivers on helping us achieve 30% on day 1 and encouraged them to spread the word. 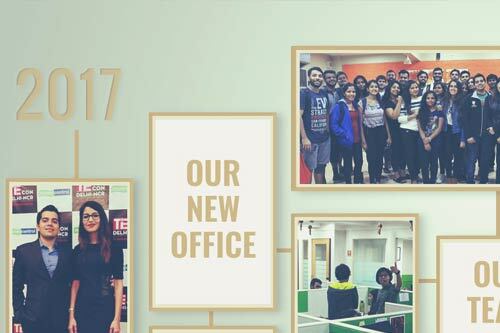 The third message was a celebration of achieving Rs 70,000 in 7 days (catchy numbers like these help!) and asked donors if they’d be willing to push it to Rs 2 lakh in 20 days (it’s alright if this doesn’t work out. The idea is to motivate people to help spread the word). 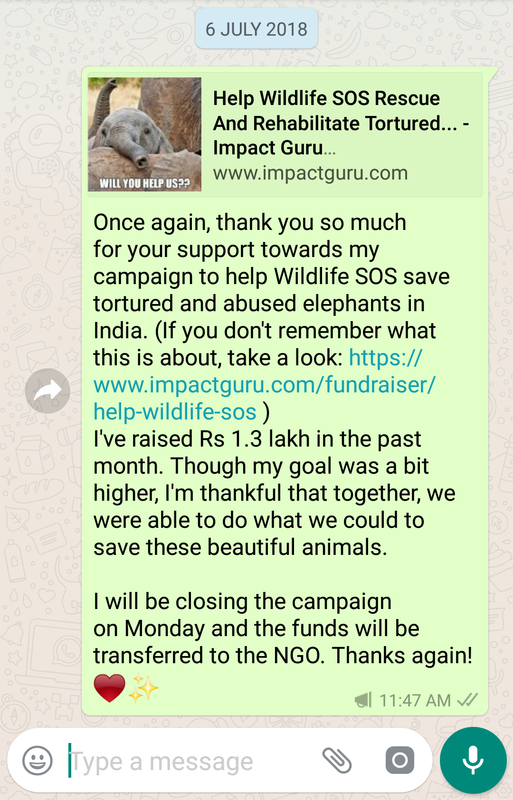 The last message was sent a few days before we closed the fundraiser, alerting receivers about what we had achieved and thanking them for their involvement. If your receiver has not made a move until the time you send this message, more often than not, this motivates them to donate and share! Instagram: Though I posted only one picture with an appeal, I put up about 10-12 stories, as this is an easier and quicker way to engage with people immediately. Each story counted the day (Day 1, Day 20) and mentioned the amount raised under it. I also used the stories to tag and thank every donor that had contributed. (@xxxyz, @xxxab, thank you guys for your kind donations!) 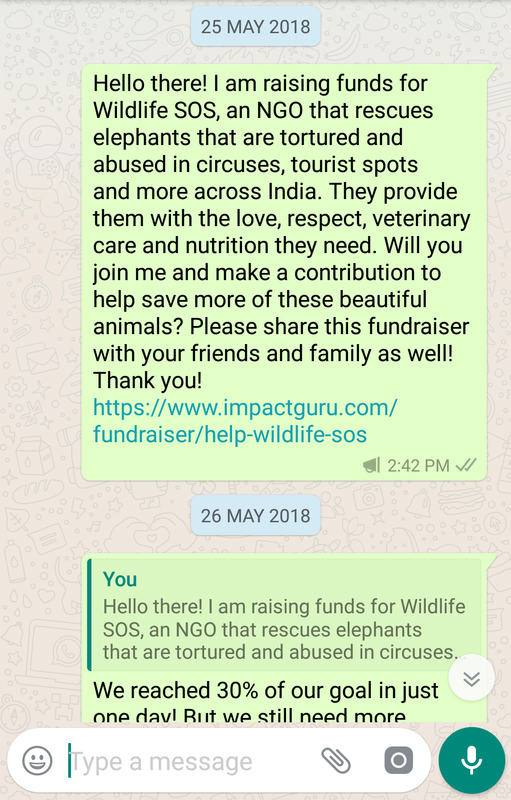 I used images of elephants Wildlife SOS had rescued in these stories and encouraged our donors to put up similar stories as well. You can check out my fundraiser here. 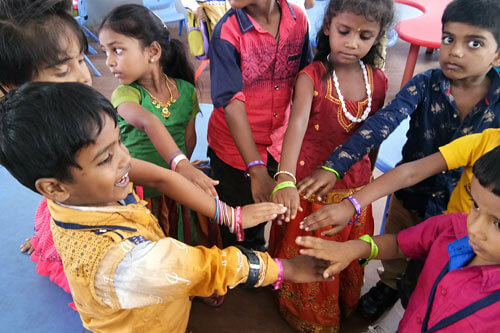 Read all about Rukmini's experience on fundraising with Wildlife SOS, here.